Inés Ramírez Pérez, a woman from the Oaxaca state in Mexico became an international celebrity in March 2000. This common woman, mother of eight kids who had no medical training, performed a successful Caesarean section on herself. Both the mother and the baby survived. On 5th March 2000, still in her seventh month of her pregnancy, Inés Ramírez Pérez felt the labor pain. She was alone in her one room cabin when the pain begin midday. Her husband who had helped her in the previous births was drinking at the catina. Three years before this incident, she had given birth to a dead baby. After 12 hours of labor pain, Ramírez feared that this baby would also leave her. She somehow wanted to bring the child into this world as early as possible. It was already midnight and the nearest clinic was about 80km away. She had no phone and even the catina where her husband was drinking had no phone. At midnight, Ramírez sat down on a wooden bench. The 40 year old drank three glasses of hard liquor and grabbed a 15 cms kitchen knife. In the light of a dim bulb she began cutting her abdomen. She cut her skin to the right of her navel vertically in a 17 cms line , starting from near the bottom of the ribs and ending in the pubic area. After operating herself for an hour she reached inside her uterus and pulled out her baby boy. As soon as the baby was out he started crying. Then with a pair of scissors she cut the umbilical cord and became unconscious. 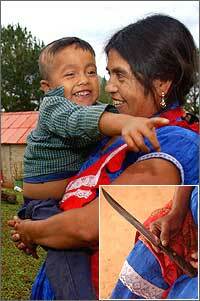 Later when she regained consciousness she bandaged her wounds with clothes and sent one of her sons to get help. After few hours, a village health assistant Cruz and one more health worker found both mother and son alive besides each other. Cruz sewed the seven inch cut with normal needle and thread. Then both of them carried both the mother and the child on a thin-straw mat to the road and drove by a small bus for two and half hours to the nearest clinic. Here Ramírez recieved basic medical attention and then she was taken to San Pedro by a pickup truck. Later, two obstetricians examined her and performed a surgical repair of the incision site. After six days a second surgery was done to repair complications resulting from damage to her intestines. She was discharged from the hospital after 10 days of her operation and recovered completely. Ramírez then said, “I couldn’t stand the pain anymore,” she said. “And if my baby was going to die, then I decided I would have to die, too. But if he was going to grow up, I was going to see him grow up and I was going to be with my child. I thought that God would save both our lives.” Dr. Galván who examined Ramírez, recalls that there was no sepsis in the wound, nor was there any internal bleeding. Everyone at the hospital was amazed that Ramírez was not in shock and was conscious. Galván’s colleague Dr. Jesus Guzman, opened Ramírez and had found that her uterus had returned to its normal size, there was no bleeding and she showed no signs of infection. According to Galván, Ramírez’ life might have been spared as she sat forward in what he called the traditional Indian birthing position. Due to this, her uterus was directly under the skin and she did not cut her intestines. 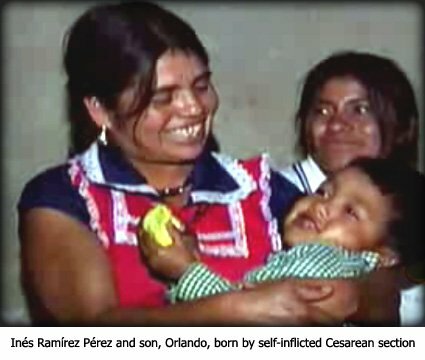 Ramírez is believed to be the only person known to have performed a successful caesarean section on herself. Her case was written up in the March 2004 issue of the International Journal of Gynecology & Obstetrics. She has however advised other women not follow what she did.